Movie producer-director George Miller (”Mad Max”) is 74 on March 3. March 3: Singer-guitarist Mike Pender of The Searchers is 78. 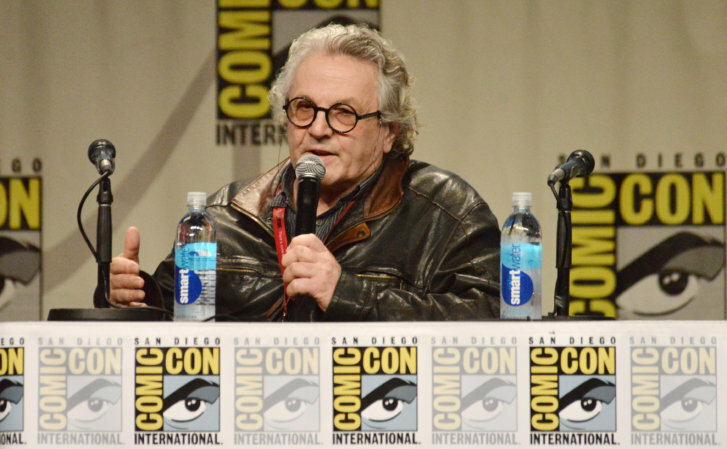 Movie producer-director George Miller (”Mad Max”) is 74. Actress Hattie Winston (”Becker”) is 74. Singer Jennifer Warnes is 72. Actor-director Tim Kazurinsky (”Police Academy” films) is 69. Musician Robyn Hitchcock is 66. Guitarist John Lilley of The Hooters is 65. Actress Miranda Richardson is 61. Actress Laura Harring (”Mulholland Drive,” “Gossip Girl”) is 55. Drummer Duncan Phillips of Newsboys is 55. Rapper-actor Tone Loc is 53. Actress Julie Bowen (”Modern Family”) is 49. Singer Brett Warren of The Warren Brothers is 48. Actor David Faustino (”Married—With Children”) is 45. Gospel singer Jason Crabb is 42. Singer Ronan Keating of Boyzone is 42. Rapper Lil’ Flip is 38. Actress Jessica Biel is 37. Guitarist Joe “Blower” Garvey of Hinder is 35. Musician Brett Hite of Frenship is 33. Singer Camila Cabello is 22. Actor Thomas Barbusca (”The Mick”) is 16. Actress Reylynn Caster (TV’s “Me, Myself and I”) is 16. March 4: Actress Paula Prentiss (1975’s “The Stepford Wives”) is 81. Movie director Adrian Lyne (”Fatal Attraction”) is 78. Singer Chris Rea is 68. Actor-singer Ronn Moss of Player (”The Bold and the Beautiful”) is 67. Actress Kay Lenz is 66. Musician Emilio Estefan of the Miami Sound Machine is 66. Actress Catherine O’Hara (”Home Alone,” `’A Mighty Wind”) is 65. Actor Mykelti Williamson (”Forrest Gump”) is 62. Actress Patricia Heaton (”The Middle,” `’Everybody Loves Raymond”) is 61. Actor Steven Weber (”NCIS: New Orleans,” `’Wings”) is 58. Former Metallica bassist Jason Newsted is 56. Actress Stacy Edwards (”Chicago Hope”) is 54. Rapper Grand Puba (Brand Nubian) is 53. Drummer Patrick Hannan of The Sundays is 53. Singer Evan Dando of The Lemonheads is 52. Actress Patsy Kensit is 51. Actress Andrea Bendewald (”Suddenly Susan”) is 49. Drummer Fergal Lawler of The Cranberries is 48. Country singer Jason Sellers is 48. Jazz drummer Jason Marsalis is 42. Actress Jessica Heap (”The Young and the Restless”) is 36. TV personality Whitney Port (”The Hills”) is 34. Actress Audrey Esparza (”Blindspot”) is 33. Actress Margo Harshman (”NCIS,” `’The Big Bang Theory”) is 33. Actor Josh Bowman (”Revenge”) is 31. Actress Andrea Bowen (”Desperate Housewives”) is 29. Actress Jenna Boyd (”The Sisterhood of the Traveling Pants”) is 26. March 5: Actor Paul Sand (”St. Elsewhere”) is 87. Actor James B. Sikking (”Hill Street Blues,” `’Doogie Howser, M.D.”) is 85. Actor Dean Stockwell (”JAG,” `’Quantum Leap”) is 83. Football player-turned-actor Fred Williamson is 81. Actress Samantha Eggar (”The Molly Maguires,” `’Dr. Doolittle”) is 80. Actor Michael Warren (”Soul Food,” `’Hill Street Blues”) is 73. Actor Eddie Hodges is 72. Singer Eddy Grant is 71. Keyboardist Alan Clark of Dire Straits is 67. Actress-comedian Marsha Warfield (”Night Court”) is 65. Magician Penn Jillette of Penn and Teller is 64. Actress Adriana Barraza is 63. Actress Talia Balsam (”Divorce,” `’Mad Men”) is 60. Musicians Charlie and Craig Reid of The Proclaimers are 57. Actor Paul Blackthorne (”Arrow,” `’24”) is 50. Guitarist John Frusciante is 49. Singer Rome is 49. Actor Kevin Connolly (”Entourage”) is 45. Actress Eva Mendes is 45. Actress Jolene Blalock (”Enterprise”) is 44. Model Niki Taylor is 44. Actress Kimberly McCullough (”General Hospital”) is 41. Actor Sterling Knight (”Sonny With A Chance”) is 30. Actor Jake Lloyd (”Star Wars” films) is 30. Actor Micah Fowler (”Speechless”) is 21. March 7: TV personality Willard Scott (”Today”) is 85. Actor Daniel J. Travanti (”Hill Street Blues”) is 79. Bassist Chris White of The Zombies is 76. Singer Peter Wolf of The J. Geils Band is 73. Keyboardist Matthew Fisher of Procol Harum is 73. Guitarist Ernie Isley of The Isley Brothers is 67. Actor Bryan Cranston (”Breaking Bad”) is 63. Actress Donna Murphy (”Mercy Street,” `’Murder One”) is 60. Actress Mary Beth Evans (”Days of Our Lives”) is 58. Singer Taylor Dayne is 57. Actor Bill Brochtrup (”Major Crimes,” `’NYPD Blue”) is 56. Opera singer Denyce Graves is 55. Comedian Wanda Sykes is 55. Actor Jonathan Del Arco (”Major Crimes”) is 53. Drummer Randy Guss of Toad The Wet Sprocket is 52. Actress Rachel Weisz is 49. Actor Peter Sarsgaard (”Kinsey,” `’Garden State”) is 48. Actor Jay Duplass (”The Mindy Project”) is 46. Singer Sebastien Izambard of Il Divo is 46. Singer Hugo Ferreira of Tantric is 45. Actress Jenna Fischer (”The Office”) is 45. Actor Tobias Menzies (”Outlander,” `’Game of Thrones”) is 45. Actor TJ Thyne (”Bones”) is 44. Actress Laura Prepon (”Orange Is the New Black,” `’That `70s Show”) is 39. Actress Bel Powley (Film: “Diary of a Teenage Girl”) is 27. Actress Giselle Eisenberg (”Life in Pieces”) is 22. March 8: Jazz saxophonist George Coleman is 84. Actress Sue Ane Langdon is 83. Songwriter Carole Bayer Sager is 75. Actor-director Micky Dolenz of The Monkees is 74. Bassist Randy Meisner (The Eagles, Poco) is 73. Singer Peggy March is 71. Jazz pianist Billy Childs is 62. Singer Gary Numan is 61. NBC News anchor Lester Holt is 60. Actor Aidan Quinn is 60. Guitarist Jimmy Dormire (Confederate Railroad) is 59. Actress Camryn Manheim (”The Practice”) is 58. Actor Leon (”Cool Runnings”) is 56. Singer Shawn Mullins is 51. Actress Andrea Parker (”Less Than Perfect”) is 49. Actor Boris Kodjoe (”Code Black,” `’Madea’s Family Reunion”) is 46. Actor Freddie Prinze Jr. is 43. Actress Laura Main (”Call the Midwife”) is 42. Actor James Van Der Beek (”CSI: Cyber,” `’Dawson’s Creek”) is 42. Singer Kameelah Williams of 702 is 41. Actor Nick Zano (”Minority Report,” `’2 Broke Girls”) is 41. Singer Tom Chaplin of Keane is 40. Guitarist Andy Ross of OK Go is 40. Singer Kristinia DeBarge is 29. March 9: Singer Lloyd Price is 86. Actress Joyce Van Patten is 85. Country singer Mickey Gilley is 83. Actress Trish Van Devere is 78. Singer John Cale (The Velvet Underground) is 77. Singer Mark Lindsay of Paul Revere and the Raiders is 77. TV anchor Charles Gibson is 76. Guitarist Robin Trower (Procol Harum) is 74. Singer Jeffrey Osborne is 71. Guitarist Jimmie Fadden of The Nitty Gritty Dirt Band is 71. Actress Linda Fiorentino (”Men In Black”) is 61. Actor Tom Amandes (”Eli Stone,” `’Parenthood”) is 60. Guitarist Rusty Hendrix of Confederate Railroad is 59. Actress Juliette Binoche (”Chocolat,” `’The English Patient”) is 55. Bassist Robert Sledge of Ben Folds Five is 51. Drummer Shannon Leto of 30 Seconds to Mars is 49. Rapper C-Murder (AKA C-Miller) is 48. Actor Emmanuel Lewis (”Webster”) is 48. Actress Jean Louisa Kelly (”Yes, Dear,” `’Mr. Holland’s Opus”) is 47. Actor Kerr Smith (”Life Unexpected,” `’Dawson’s Creek”) is 47. Actor Oscar Isaac (”Star Wars: The Force Awakens”) is 40. Comedian Jordan Klepper (”The Daily Show”) is 40. Rapper Chingy is 39. Actor Matthew Gray Gubler (”Criminal Minds”) is 39. Guitarist Chad Gilbert of New Found Glory is 38. Keyboardist Ben Tanner of Alabama Shakes is 36. Actress Brittany Snow (”American Dreams,” `’Hairspray”) is 33. Rapper Bow Wow is 32. Rapper YG is 29. Actor Luis Armand Garcia (”George Lopez”) is 27. Actress Cierra Ramirez (”The Fosters”) is 24.